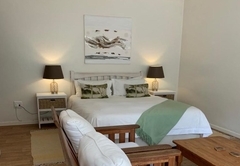 Anchor's Rest is a 4 star graded B&B with self catering option, offering Hermanus accommodation for tourists and visitors of Cape Overberg. Arrive at Anchor’s Rest to a warm welcome, the smell of the ocean, the distant sound of the waves and the invigorating champagne air. 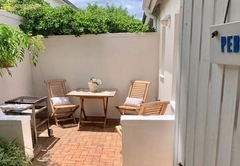 Situated in the quaint seaside village of Hermanus, 120km from Cape Town, we are a mere 150m from the famous cliff paths boasting the best land based whale watching in the world! Anchor’s Rest is a 1.8Km stroll to the village centre, which you can do along the spectacular cliff paths, whilst viewing whales in season. It lies between the historic Old Harbour (in the village) and the New Harbour and restaurants (within 10 minutes walking distance). Regret no children under the age of 7 years. Our accommodation was carefully planned to offer guests either the option of Bed and Breakfast or Self Catering or a bit of both! All the units are designed so as to offer guests maximum privacy, but we are here if you need us. We want you to enjoy your holiday as you like to - you make the choices. 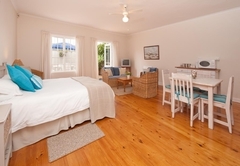 Accommodation is offered in 4 separate garden suites in beach house style décor. • Each has own private entrance and patio/garden areas and barbecue. • Optional substantial Continental breakfast, served on your patio or in your suite. • An under counter fridge, tea and coffee facilities, overhead fans, microwave, 2 plate hotplate, wall heaters, hairdryers, TV and DStv Premium and DVD machine are provided in each unit. 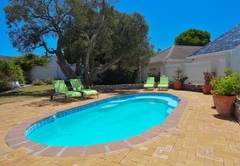 • A swimming pool and shady garden area are available for guests with pool towels available. • Secure off street parking. • Smoking on your patio only please. 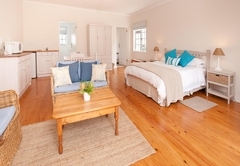 Our popular honeymoon loft suite with views of the mountain and a glimpse of the sea. 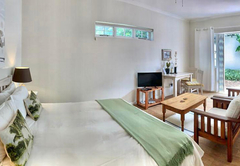 Spacious suite with queen size bed (pretty white percale cotton linen to add a touch of romance), en suite bathroom with bath and separate shower. Overhead fan, wall heater, hairdryer TV, DStv Premium and DVD machine. A separate entrance leads onto a small secluded patio with Weber, barbeque and patio furniture. Cozy breakfast area with under counter fridge, microwave, kettle and toaster etc. A substantial continental breakfast served in your breakfast nook or on your patio is an optional extra. 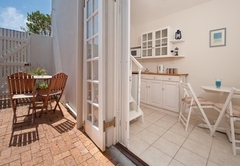 Or make your own breakfast utilizing the light self catering facilities available. 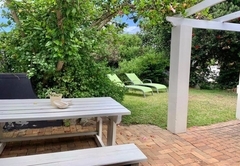 Our Self Catering or B&B garden suite with a bedroom with queen size bed, white percale cotton linen and a separate shower bathroom with haridryer.. A spacious separate living/ dining room has French doors leading onto the patio and garden area with BBQ. A sleeper couch provides sleeping for extra 2 persons. TV with DStv Premium and DVD machine, Kitchenette area with mini-oven, 2 plate hotplate, under counter fridge, microwave, toaster, kettle etc. Overhead fans and wall heaters. Secure off street parking. Health breakfast is an optional extra served on your own patio or in your room. Very popular secluded double room with its own entrance. Queen size bed with white cotton percale linen. En suite shower. French doors lead onto pretty private patio area with BBQ facilities. Colour TV and MNet,and hairdryer. 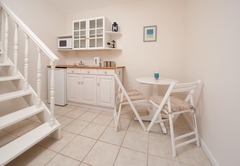 Under counter fridge, toaster, 2 plate hotplate, kettle etc in small kitchenette area. Overhead fan and wall heater. 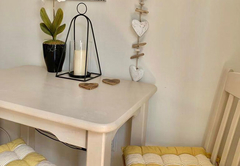 A substantial continental breakfast is an optional extra served on your own patio or in your room, or make use of the light self catering facilities provided. (Driftwood and Pebbles are cleverly designed to become inter-leading, if required, making a 2 bedroomed, 2 bathroomed cottage. If occupied separately, however, privacy is guaranteed as the entrances are distant from each other). Our spacious family unit consists of an airy open plan living room with Queen size bed and a separate small bedroom with 2 single quality single beds. 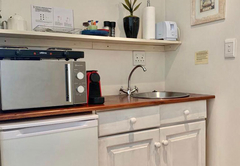 The main room includes a kitchenette area with under counter fridge, microwave, 2 plate hotplate, toaster, kettle etc. and seating for meals. Living area with TV MNet. DSTV Premium and DVD machine. Overhead fan, wall heater, hairdryer. Bathroom off the main room with bath & shower. Own private entrance onto enclosed patio with BBQ and patio furniture. 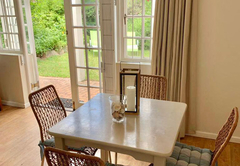 A substantial continental breakfast is an optional extra, served on your own patio or in your room. 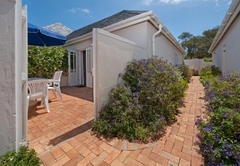 Or you can prepare your own utilizing the light self catering facilities provided. The cliff paths offering spectacular whale viewing, and wild flowers are just about on our doorstep. Stroll along them to the village about1.8 km and visit the picturesque Old Harbour and museum. Browse through the craft shops and art galleries and stop for refreshments at one of the pavement cafes overlooking the bay. Take a drive to the spectacular beaches including Grotto Beach with Blue Flag status and walk to the lagoon. Visit the New Harbour within walking distance and see the active fishing boats, and enjoy a meal (or a sundowner) at one of the 2 restaurants overlooking the sea. Choose one of the graded hiking trails in the Fernkloof Reserve, home to over 1600 plant species or take a leisurely drive through the Hemel en Aarde Valley and enjoy a wine tour at one of the estates. For the more adventurous there are whale and great white shark tours, scuba diving, paragliding and kayaking. Or enjoy a game of golf at one of the two world class golf courses. Ride a horse along the beach. Take a day trip to the southernmost point of Africa visiting places of historical interest along the way. There is something for everyone! We will gladly help you plan your excursions and assist with bookings if necessary. 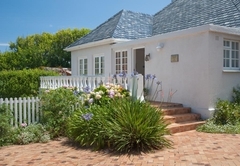 Sleeps 2-4 guests: This 2 roomed cottage has a Queen size bed and a shower bathroom. A separate living / dining room with kitchenette. A sleeper couch provides extra sleeping arrangement. 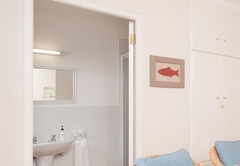 Sleeps 2 Guests: Our smallest room has a Queen size bed and en suite shower. French doors lead onto a secluded patio area with barbecue facilities. Mini kitchenette. 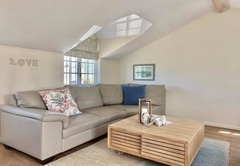 Sleeps 2 Guests: Our airy and spacious loft suite with a touch of romance has views of the mountain and a glimpse of the sea. Perfect for honeymooners! 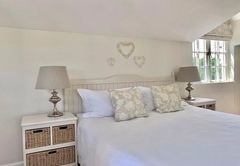 Sleeps 2 - 4 Guests: Spacious open plan bedroom/living area with a Queen size bed. Separate small bedroom with 2 single beds off the main room. Full modern bathroom. Really lovely for a family of 4. Tranquil and relaxing, yet plenty for the kids to do. Highly recommended. This is our third stay at Anchors Rest and I don't think that would happen if we didn't like it there. We have always enjoyed the hospitality at Anchors Rest, this is also our second time in Pebbles, may there be many more visits to come. Response timeAnchor's Rest typically responds to requests in 5-10 minutes. 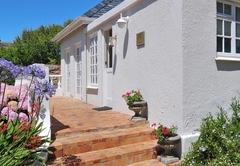 Exceptions to check-in/out times may be arranged with owners in Low Season, please enquire.